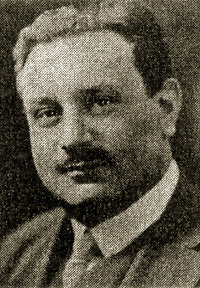 French historian and Nazi collaborator under the Vichy government, Prof. Bernard Marie Louis Faÿ was reponsible for the arrest or death of almost a thousand freemasons. 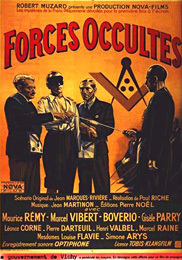 Although not credited, he provided much of the information for the short film Forces Occultes, Vichy France's attempt at Nazi propaganda, accusing French freemasons and Jews of deliberately pushing France into war against Germany. In December 1946 Faÿ was tried, found guilty, and sentenced to perpetual hard labour by the Court of Justice of the Seine. On 30 September 1951 he escaped and fled to Switzerland.4 Pardened in 1953, he continued his writing career. 1. Franklin, the apostle of modern times, Boston : Little, Brown and Co., 1929. 547 pp. The Bulletin of the Grand Lodge of Iowa noted: "This volume cannot be trusted, because in a section of one of its chapters, one devoted to Franklin as a Freemason, almost every statement of fact is questionable." In New Republic R. M. Lovett described the book as "dilute and mediocre", also questioning some of the allegedly documented statements of fact, wondering if they were not really speculation "which might well be spared." A later book, Revolution and Freemasonry, 1680-1800 (1935) demonstrated a similar disregard for masonic historical facts. In New York Herald Tribune Books, in reviewing Revolution and Freemasonry, H. S. Commager commented that "M. Faÿ ... will have his little joke. . . . as fascinating a piece of historical sophistry as has appeared in many a year." Still another book, Louis XVL or The End of a World, failed to convince any of its reviewers of its revisionist thesis; as C. A. Gilozzo pointed out in Best Seller, knowledge of the "major historians of the French Revolution" was "sorely lacking." 2. Court Records of the ten-day trial held in Paris, beginning 25 November 1946, Judge Ledoux, presiding magistrate. See : "Anti-Masonry" Coil's Masonic Encyclopedia, page 61; Cerza, "A Masonic Reader's Guide", Transactions of the Missouri Lodge of Research, volume 34, 1978-1979, p. 164; Denslow, Freemasonry in the Eastern Hemisphere, p. 178. Cf. : "The information led to the deportation of 520 French Freemasons and the death of 117." Reflections, Volume 19 No 19 May 2002. editor : Nisar Sarwar. 3. Michael Burleigh , The Third Reich - A New History. New York : Hill and Wang, 2000. hc 995 pp. p. 471. 4. La Chaîne d'Union, No. 2, 13th Year 1951-1952, p. 90, citing Le Monde No. 2.081, 4 October 1951. Cf. : "After the war, Fay was sentenced by a war crimes tribunal to life in prison. In 1953, after serving seven years, he was pardoned by presidential decree." Reflections .Volume 19 No 19 May 2002. editor, Nisar Sarwar. vreflect.com/may2002/amazing.html. "...on last reports was serving a life sentence in France...." Twentieth Century Authors, First Supplement. A Biographical Dictionary of Modern Literature, Ed., Stanley J. Kunitz. New York : The H. W. Wilson Company, 1955. Further citations are available here.